It’s my fault. Having been born, raised, and living in New England my whole life, I should’ve known better than to switch from my winter wheels and snow tires to my summer wheels with summer tires in late March. The frequent days of warm temperatures led me to mistakenly believe that after a rather easy winter, we were all done with the white slippery stuff. 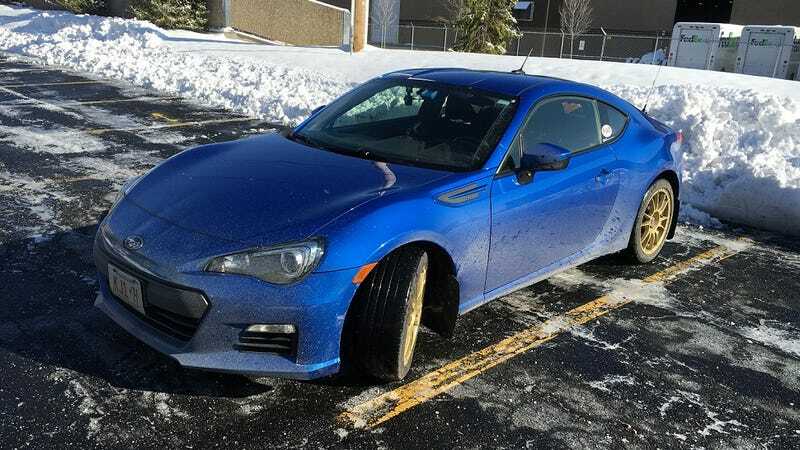 And my Michelin Pilot Super Sports totally transform my BRZ with their high grip and precise responsiveness to my control inputs. I couldn’t resist. And switching to tires that absolutely can not handle snow is precisely what caused the snowstorms that hit the northeastern US this past week. So to all of you, I apologize. I tried to swap back to my snow tires after the storm dropped 6" of snow on us. Unfortunately, on the second wheel I worked on, the lug nut began feeling tighter a couple of turns after coming loose from the wheel. This was the same feeling I felt just before snapping a wheel stud after the local dealer rotated my tires just before NYIAS. I aborted the mission, torqued all of the lug nuts back to spec, and put the other summer wheel back on. I didn’t have any more wheel studs to to replace it if I broke it, nor was I about to get any at that time of night. BRZ/FR-S/86 wheel studs are known to be fairly weak and not hold up well to repeated wheel swaps. I ordered up a full set of 20 aftermarket replacements to solve this problem, which is now becoming a regular thing. But it doesn’t solve the problem of snow and Pilot Super Sports. Though we got plowed out, there was still a layer of packed snow on top of the pavement, and overnight temperatures were too cold to melt it. It was going to be an interesting commute the next morning. Thanks to cold temperatures overnight, conditions hadn’t changed the following morning. I knew that the main roads were fine, so with some fear and trepidation I backed out of the garage onto the snow. I managed to do my walking pace three-point turn just fine. (There isn’t enough space to try a Rockford, and even if there was I probably would’ve spun into the trees anyway.) Naturally, just as I started driving down the hill, my wife came up the driveway after completing a school run. I tried backing up to give her space, but on the extremely gentle slope I was on all I managed to do was spin the wheels. It was useless. My wife pulled over onto the lawn, which her Ford Flex tackled easily, and allowed me to roll downhill to leave. Rolling was about the maximum speed that I felt safe. Pulling out of my driveway, I feared that someone would come around the blind curve too fast and slam into me before I could ever so slowly accelerate through my left turn. But I made it, and putting stability control into VSC Sport allowed enough wheelspin and sideways action for the car to actually move while still preventing me from sliding off the road. I then proceeded at half impulse power of my normal speed on a very mixed surface of wet pavement and loose and packed snow. How horrible are the otherwise awesome Pilot Super Sports in such conditions? Slow, unless you have no clue how to drive, a death wish, or both. The sensation was quite similar to how the Mustang’s Pirelli P Zeros felt on gravel rally stages. In both cases, the tires felt like they were floating loosely on top of the surface rather than digging in and getting a grip. And in both cases, I was using summer tires for something they were absolutely not designed to do. But by keeping my speed down (relatively speaking, in the Mustang) and not asking the tires for more than they were capable of delivering I managed to keep the car on the road. As soon as I got to the highway, I was fine. Roads were well treated and just wet. The back roads I took closer to the office had a little snow scattered here and there, but nothing like at home, except for the semi-private road my office is on. I must’ve looked like a complete hooligan entering the lot sideways with a bunch of opposite lock, even at walking speed. Fortunately the lot itself was plowed better than the road and down to bare pavement.